An online form is a set of questions that can be predetermined by yourselves, and can then be answered on site by the carer. 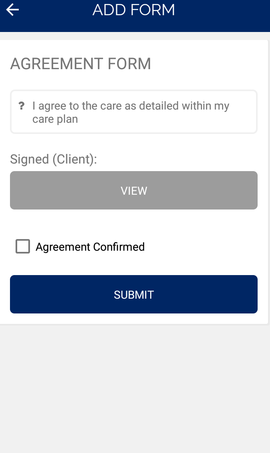 Forms are now available on the CareForIT Carer App for both Android and iOS phones. Morning call - Did the Service User eat all of their breakfast? Lunchtime call – Was cleaning performed? Dinner call - Did the Service User eat all of their dinner? Bed Call – Has the Service User been put to bed? 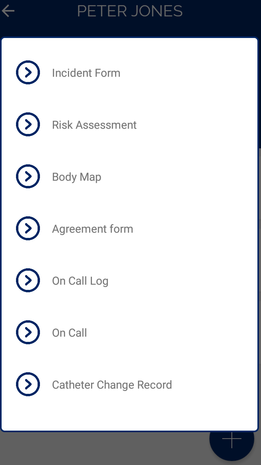 Once the forms have been built into your CareForIT system, these can be completed on the CareForIT Carer App by the carer. Forms will show under the 'Functions' menu on your CareForIT system once built in. You can add forms to be completed as you would add a one off booking, by completing the necessary fields on the booking form. Once the form status bar shows as 'Updated Form' you can refresh the screen to view the 'form' tab. You are then able to input information and click the 'Print Form' button to download or print the form. You can view the form data either by going to the Functions - List View and filtering 'Assignment Type' by the form name, or viewing the the 'Forms & Tasks' report within the 'Standard Reports' folder on CareForIT. The 'Forms & Tasks' report allows you to filter the information by start and end date and client or staff name. For further information on the Standard Reports please click here. Carers can complete forms on the app by pressing the '+' symbol on the bottom right of the screen. Clicking this button will show a list of staff related forms available - for example annual leave requests, appraisals and supervisions etc. 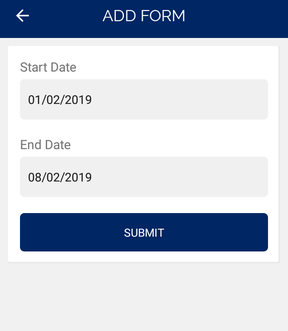 Once the staff member has filled in all the necessary questions, they will need to click the submit button to save the form. If working online, this form will show on your CareForIT system once submitted. If the carer is working offline, to sync the form data they would need to be connected to internet signal or wifi and sync the data from their app. To complete a service user form on the app, you would need to click into the service user profile by clicking their picture and click the '+' symbol. This will show a list of available forms. Once forms have been submitted on the CareForIT Carer App, these will show up on the list view. You can click into the booking number to view the form data, or use the Forms & Tasks report available under the 'Standard Reports' on your CareForIT system. For more details about online forms, please contact your Account Manager. If you would like us to build in any forms for you, please email a copy of the forms to support@care-for-it.com to be sized.